Happy Easter! The Easter Bunny treated us well this year so we thought we would share his basket ideas with everyone along with the excitement a 2 year old brings to the Easter holiday! 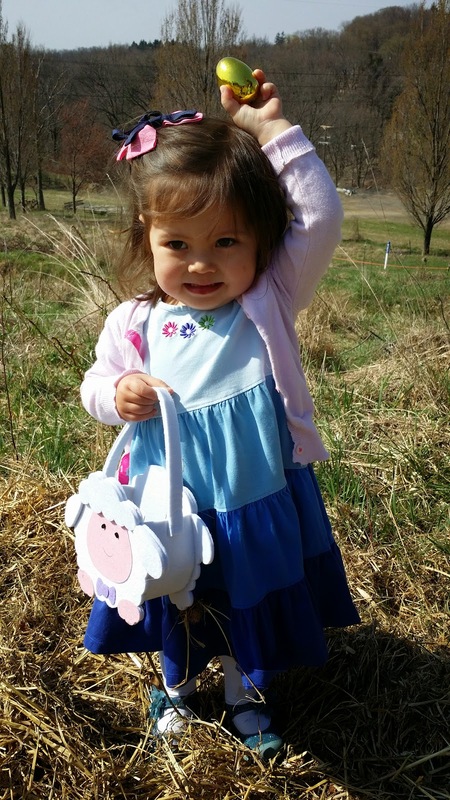 Of course the Easter Bunny brought us some candy filled eggs and a chocolate bunny, but he must of had some insight into how Eliana's parents would react to an entire basket filled with candy. So, he decided to add some other exciting items to the basket without going overboard (i.e. very reasonably priced with some items even very practical). 1. What would I most likely buy my child anyway because (summer/vacation/other) is almost here? Answer for our 2 year old: We would buy bubbles and sidewalk chalk because we would want to enjoy them once the warm weather starts to set in. 2. Does your child need anything due to changes (moving from a crib to a bed/a new sibling/clothing) in his/her life? Answer for our 2 year old: A night light and socks. She just moved into a big girl bed which is also in her new big girl room. Since we introduced several novel things at once we thought it would be fun to get her a night light to make the experience more exciting and comforting. We also almost always need more socks. So Eliana got some Princess Sofia socks in her basket. Are we against candy? No. Of course Eliana's Easter basket contained candy. 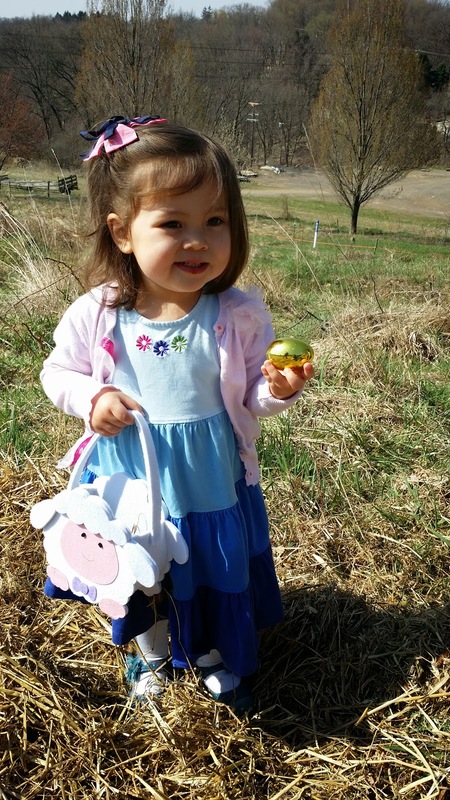 She received a chocolate bunny, 4 eggs with a few candies inside and 2 mini candy bars. She also got the candy necklace and bracelet seen in the photo above. We give candy in moderation and we couldn't imagine an entire basket filled with candy for a 2 year old. Plus, we knew she would be just as (or more) excited to get the Princess Sofia socks as she would be to receive another candy bar. Plus, we needed more socks. So this basket was a win-win for us this year! What items do you add to your Easter baskets? I almost bought a pair of pajamas with Minnie Mouse on them thinking they could be the "filler" in the basket - but talked myself out of them because she doesn't really need any more pajamas right now (and they weren't very soft...).